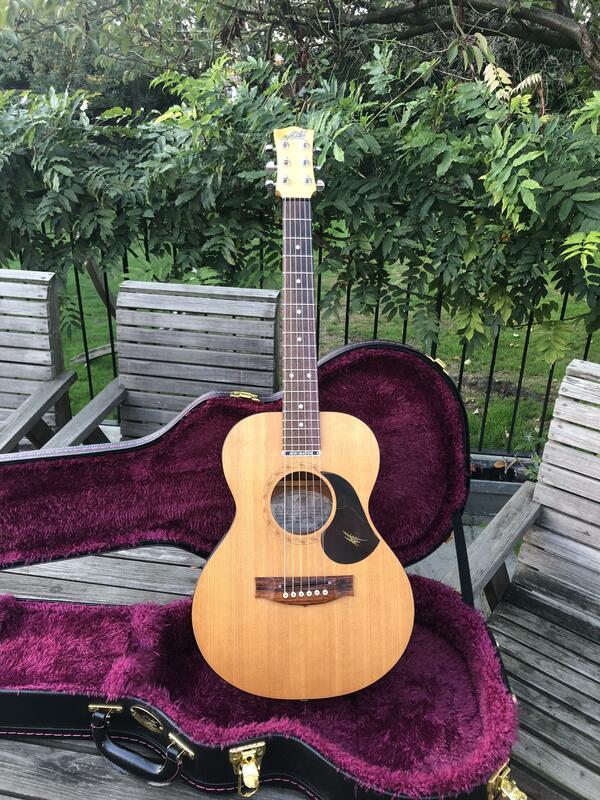 Bit of a change from my ceaseless tide of electric geetars (although it is equipped with a spot of its own electric pickup wizardry): have just acquired this really rather lovely pint-sized Mini Maton EML6. Quite liked the idea of having something small enough to chuck in the car boot when I'm on my travels, and after Satan's own job dealing with popping bridge pins when changing strings, first impressions very, very good: twangy, responsive, far more bottom end than the almost uke-sized body would lead one to expect, and a whole heap of extremely light and portable fun. Maton make fantastic acoustics, I love mine, enjoy! I've looked at these too, but I'd really have to play one before committing, and nowhere in the midlands seems to stock them. Well if you’re ever round exotic Barnet and fancy a road test (and if I can prise it from my son’s hands) you’re welcome.